Who let this guy on the front page of the national broadcaster’s website? Well. What a manic past 30ish hours I’ve had. My Gmail account is ready to retire for Florida after the hard work it’s been putting in since yesterday afternoon. I sat down at work yesterday and got a message from one of my former colleagues at the ABC, asking me whether I’d be interested in knocking up a colour piece on what it’s like being an Aussie living through the wild winter weather the US is currently experiencing. Hmmm. Should I? I mean … I’m at my desk at the KJ, waiting for copy to come in so I can do my new job. Do I really want to write something for Aunty that probably no one will read? I’m going to go out on a limb here and assume the majority of the people reading this post now already know the answer to that question, because that’s how they discovered this curious excuse for a website to begin with. I did indeed write the story for the ABC – it’s right here, if you haven’t already read it – and received quite warm praise for something I thought was a bit of a laugh, a knock-together yarn taking the piss out of myself. I cheekily added a link to this blog at the bottom, and wouldn’t you know it? People actually clicked and visited Crawfin’ USA. And kept clicking. And kept visiting. The last two days have been responsible for, at the time of writing, more than two-thirds of the total page views this blog has received since its inception in mid-December. You guys ROCK. So I’d like to say a couple of things – firstly, to all my new readers and subscribers: g’day and welcome! I hope I can make your visits worthwhile by providing tales of my absolute ineptitude and childlike fascination with winter and my bumbling/endearing efforts to settle into life as an American resident. Secondly, and this is kinda unfathomable to me and extremely exciting, my editors at work read the aforementioned ABC piece last night and decided that the barfly I paid to ghost-write it for me was worthy of some column inches in the Kennebec Journal and Morning Sentinel newspapers every few weeks! I can’t believe this turn of events, but you heard it here first: my fish-out-of-water experience will now be available on newsstands in actual print. Whoa. So stick around, pour yourself a drink and have a laugh at my expense, or learn more about the green card process and how it is I got to be here. Leave me comments, ask me questions, call me a muppet, whatever you like. It’s good to have you here! Print? Do they still have that? 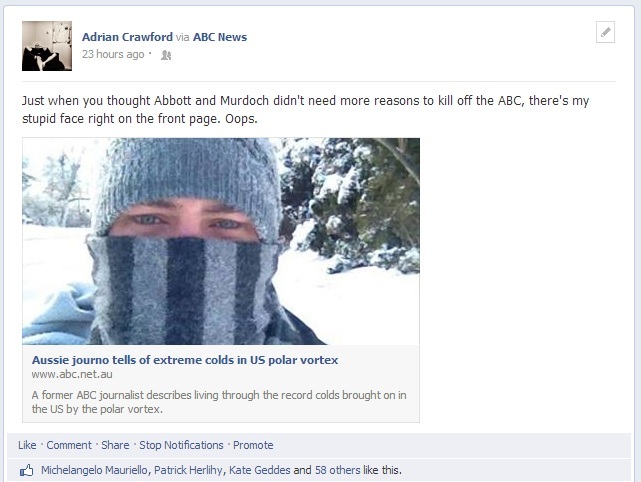 But seriously, thanks for an entertaining and informative blog (and thanks to the ABC, who brought me here). Thank God for the Australian Broadcasting Commission. Otherwise I would have missed this by-way gem of journalism, calculated to give reading pleasure (and costs zilch!). Glad we helped, seriously its your talent and wry observations on whats happening we are enjoying, just be yourself. Carry on.